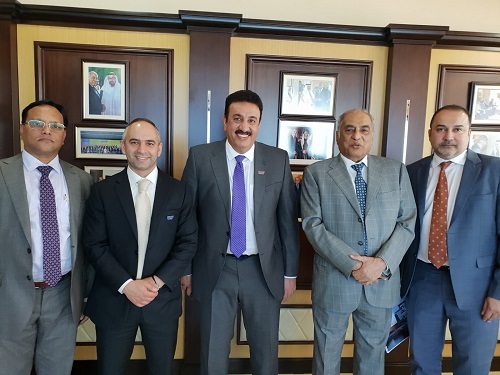 The Bahrain Institute of Banking & Finance (BIBF) announces the appointment of Dadabhai Construction as the main contractor of its new iconic building in Bahrain Bay. The plans set forth for the construction of the state-of-the-art multi-storey building will contribute to Bahrain’s skyline as an iconic symbol of modern architecture, providing safe and convenient facilities to support the learning process and improve the educational tourism in Bahrain. Dr. Al-Shaikh also pointed out that the increasing demand for the Institute’s programmes is a reflection of the confidence in the quality of training provided, and this expansion plan will further support this growth and improve the learning experience. Head of Digital Transformation, Project Management & Operations, Mr. Ahmed Naeemi, highlighted that the construction of the building is expected to be completed within 16 months of signing the contract. The Headquarters building will be a landmark, with a total structural area of 25,000 square meters that stands as a luxury waterfront development. Mr. Naeemi added that the national-scale project is to be delivered by end of 2020, and will provide high-tech technologies, cutting-edge facilities and electronic innovation to ensure the highest standards of efficiency, innovation, and a positive learning experience. The building infrastructure influences how students, staff and visitors feel when they first enter the building and as they move across it. The quality and abundance of halls and study areas, signage, lighting, safety and security, branding, and facilities all contribute to the experience and the impression of the institute. The project includes a master building consisting of ten floors, with more than 50 lecture halls and a state of the art auditorium to accommodate 300 attendees at a time. In addition to state-of-the-art Dealing Simulation Room, Library, spacious Cafe, student lounges, executive lounges, examination halls, and state of the art computer labs. This is all with taking into consideration the application of the latest technology, quality and environmental protection standards.